mindless euphoria. We are lucky to have them. To get some idea of how actively engaged in music and culture Pet Shop Boys continue to be, you could do worse than take a look at their diary for 2016. On Friday, the duo release Super, their 13th studio album. In July, they will play four nights at the Royal Opera House. And last week in Edinburgh, bang on the 30th anniversary of the release of Pet Shop Boys’ debut album, Please, a symposium was held, discussing topics such as The Nicest Eyelashes in the History of Pop Music, and New York City Boy, Disco Pastiche and the Haunting of Aids. Just as instructively, you could look back over the 30-plus years that Neil Tennant and Chris Lowe have been making music together. The sheer diversity in the work they’ve produced, the subject matter their writing addresses, the people they have collaborated with, is startling: David Bowie, Derek Jarman, David Alden, Sam Taylor-Johnson, Dusty Springfield, Simon McBurney, Es Devlin, David Fielding, Johnny Marr and Bernard Sumner, Zaha Hadid, Liza Minnelli, Wolfgang Tillmans, Bruce Weber, Trevor Horn, Juliet Stevenson. Genres such as opera, ballet, photography, musical theatre, film scores. And, at the heart of PSB, the defining factor in their DNA: pop. Without it, they both say, they are nothing. We meet in PSB’s HQ, four rooms (in one of which they recorded Super) on an anonymous side street in east London. Received notions about the Pets are that Tennant is the gabby, acerbic one, and Lowe his laconic, limelight-shunning sidekick. That’s partly true: Lowe is clearly fame-averse. Yet he’s anything but monosyllabic. On the contrary, he regularly chides and teases Tennant, who he first met in an electrical shop in London 35 years ago. Both say they couldn’t imagine being in a band with people they didn’t see a lot of, and weren’t firm friends with. “We do find that a little difficult to understand,” Tennant says. “Because it must be lonely if you’re in a band and you’re touring, but you don’t really get on with each other.” In public, however, Lowe is a man of few words, and often none at all — which Tennant delights in ribbing him about. 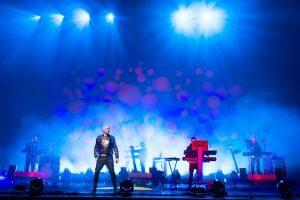 I attempt to steer the conversation back to pop, and why some people still feel the need either to defend it or to dismiss it, but we have clearly reached that time-honoured point in a Pet Shop Boys interview where the tone has become too waspish, and the laughter too gleefully catty, for it to be reined in. Talk has moved on to dentists’ drills, for some reason, and whether, as children, we found the fast or slow one preferable. I try again. If you write lyrics, I splutter, that are sharply drawn and considered (which Tennant indisputably does), then accompany them with music that is morose, even somnolent, well, don’t you just end up with Radiohead? For once, Tennant refuses to rise to the bait. “I’m always writing down words and phrases. There’s definitely a diary element to what we write about. Every Pet Shop Boys album is a picture of the world as we experience it at that time. So you have that, which is sort of the Neil side, but then you have the Chris side, which is sort of simply about euphoria. There’s a balance between observation, even analysis, and mindless euphoria — which is, in some ways, how you deal with the reality of life. That’s what you like, isn’t it?” he says, turning to Lowe and sounding as if he’s about to pat him on the head. “It’s one of the things I like,” Lowe mutters. That’s rock sorted, dispatched. But what about pop? Poor, blameless, brilliant pop, still patronised as a poor relation (though thankfully not in such numbers, or with such venom, as of old). Pet Shop Boys make pop, unashamedly, as we’ve seen. But they also take it as a starting point for other expeditions, either within their chosen genre or outside it. They’re doing pretty well in the former: Super is a fantastic album, with songs inspired by, among other things, Kim Jong-un (The Dictator Decides, its chord sequence nicked from Vivaldi, its lyrics creating a picture of a tragic figure trapped in a prison of his own making) and a visit to the Volkswagen factory in Wolfsburg, Germany (Sad Robot World). Which sort of begs the question: where are the other chart artists and acts, now Bowie has left us, who have the curiosity to notice such things and the willingness/daring to write about them — in a pop song? “People like David Bowie, and in a different, though maybe slightly similar way, ourselves,” Tennant muses, “look outside pop music and think, ‘You could bring this into pop music.’ Kanye West has sort of done that, but I think that what he does is, he leaves the music to go and do it, and is therefore doing ‘it’ and not music. And maybe he’s not as good at ‘it’ as he is at music.” He’s warming to the Kanye theme. “He’s fashioned for himself this mink-lined trap, in the centre of which, he’s broke. And the whole thing just keeps getting bigger. Suddenly, your album launch is a huge fashion show and, yes, Anna Wintour is there, and you could be running for president in four years’ time. There are no limits to your ambition, and social media will help you to project that, in a bigger and bigger way, until it must just sort of turn into a nightmare. For 30 years, Pet Shop Boys have stayed true to pop, stray though they will, and kept making brilliant records. They always come back to one “little room like this” or another, searching for luck, for that perfect inspiration, Neil handling the observation, keeping the mental diary, Chris zeroing in on the euphoria, the moronicness. “Is that even a word?” Tennant asks. “Yes, it does sound a bit wrong,” Lowe agrees. “Maybe it should be ‘morony’.” A pause.